CVS Health Corporation (CVS), together with its subsidiaries, provides integrated pharmacy health care services. It operates through Pharmacy Services and Retail/LTC segments. The Pharmacy Services Segment provides a range of pharmacy benefit management (PBM) solutions. The Retail Pharmacy segment includes retail drugstores, online retail pharmacy Websites and its retail healthcare clinics. The company announced that it is raising its quarterly dividend by 17.60% to 50 cents/share. This is the fourteenth consecutive annual dividend increase for this dividend achiever. In addition, with a new $15 billion share repurchase authorization, the company now has more than $18 billion authorized to be used for share repurchases over the next few years. 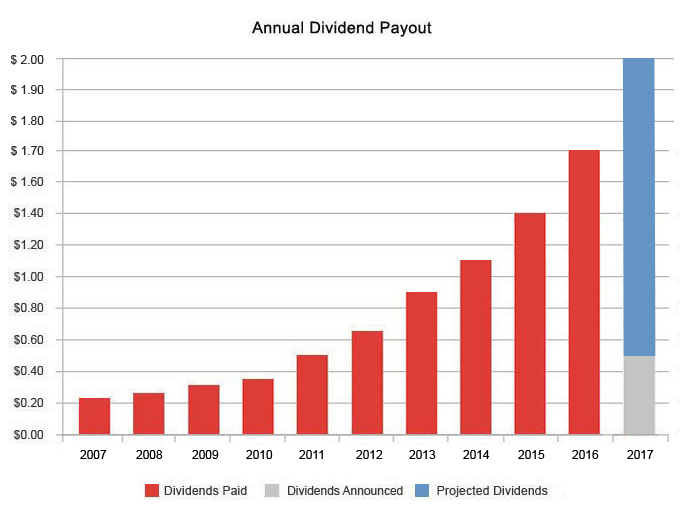 Over the past decade, the company has managed to boost dividends at a rate of 25.40%/year. This is some impressive dividend growth out there for CVS Health shareholders. However, I would expect that this rate of annual dividend growth to slow down a little over the next decade. If CVS Health managed to grow dividends at a rate of 10%/year, supported by strong earnings growth from here, I would be a happy camper. This was supported by a solid 12.30% average increase in annual EPS over the past decade, and a low payout ratio. I analyzed the company in November, and initiated a position around that time. Please check my analysis of CVS Health for more information about the company. Currently, CVS is attractively valued at 16.40 times forward earnings and a yield of 2.50%. I took advantage of the huge sell-off last month and initiated a small new position in the stock. Given the rapid increase in dividends, I think that the stock is a good value today.